First movements appeared in the early 20th century in Germany and Austria. Recovery of Norse, German and Anglo-Saxon beliefs. Modern Pagans tried to fit them within their own format. 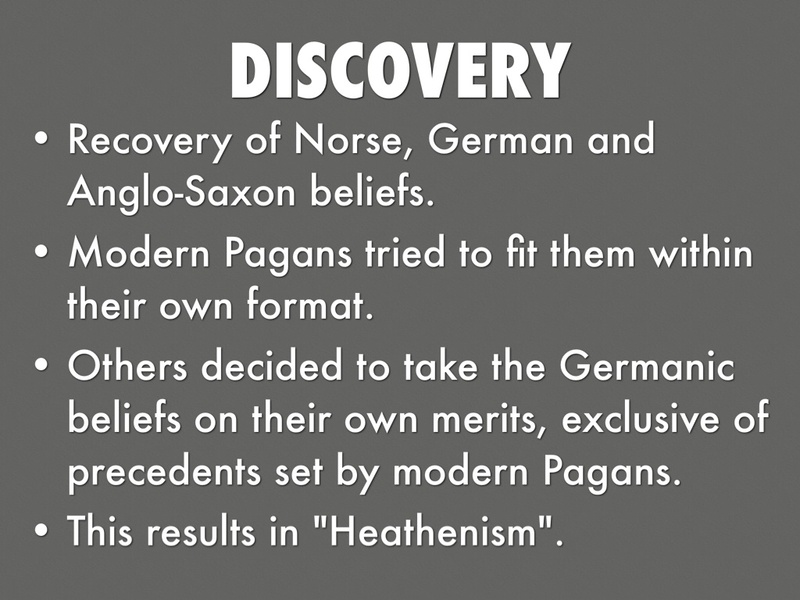 Others decided to take the Germanic beliefs on their own merits, exclusive of precedents set by modern Pagans. 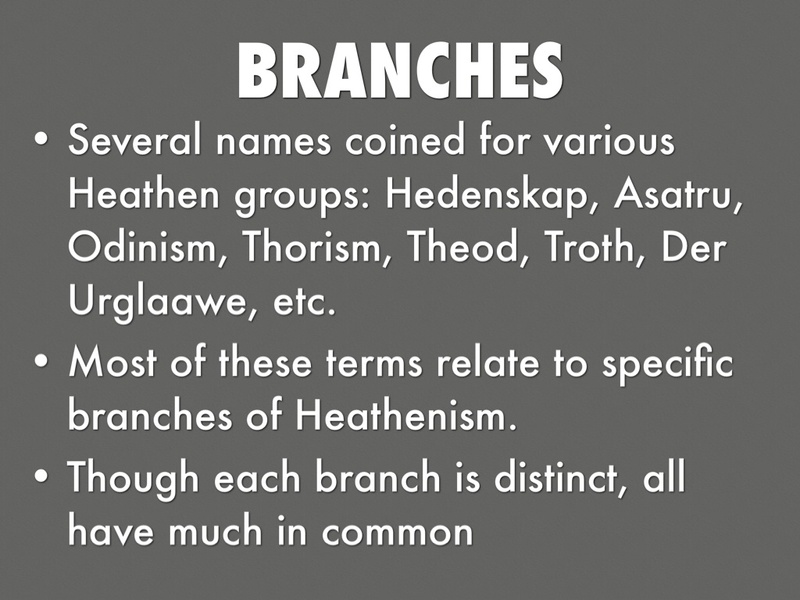 Several names coined for various Heathen groups: Hedenskap, Asatru, Odinism, Thorism, Theod, Troth, Der Urglaawe, etc. 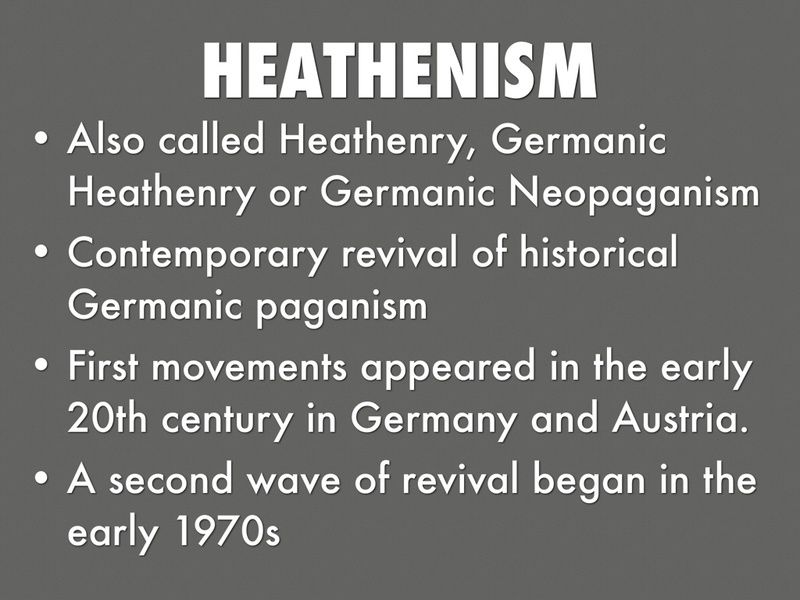 Most of these terms relate to specific branches of Heathenism. 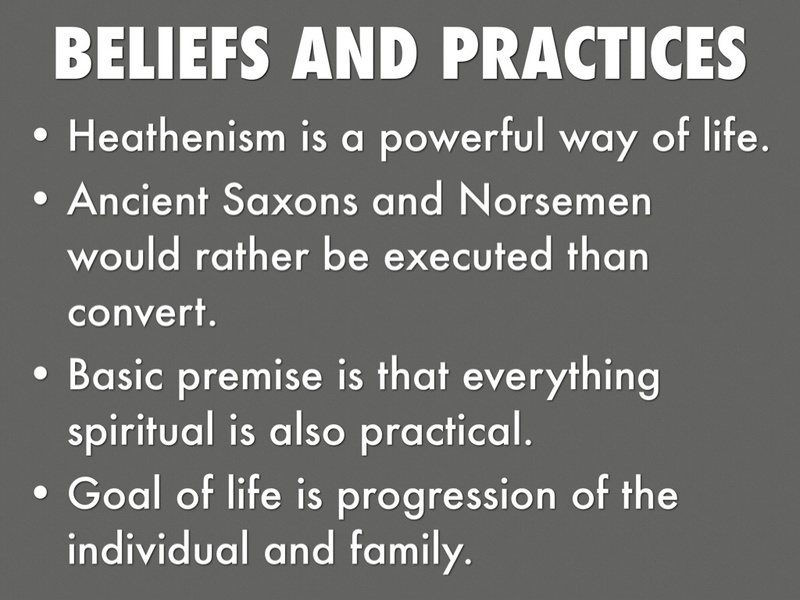 Heathenism is a powerful way of life. Ancient Saxons and Norsemen would rather be executed than convert. Basic premise is that everything spiritual is also practical. Goal of life is progression of the individual and family. 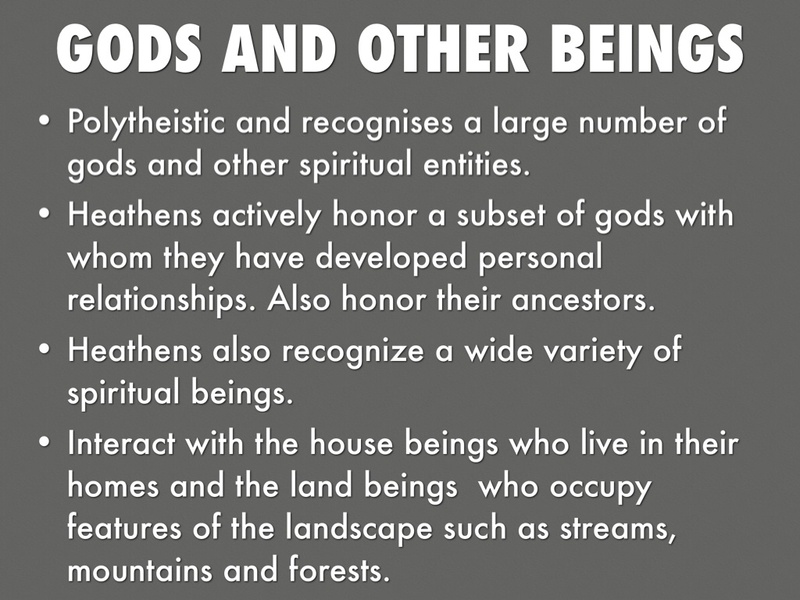 Polytheistic and recognises a large number of gods and other spiritual entities. 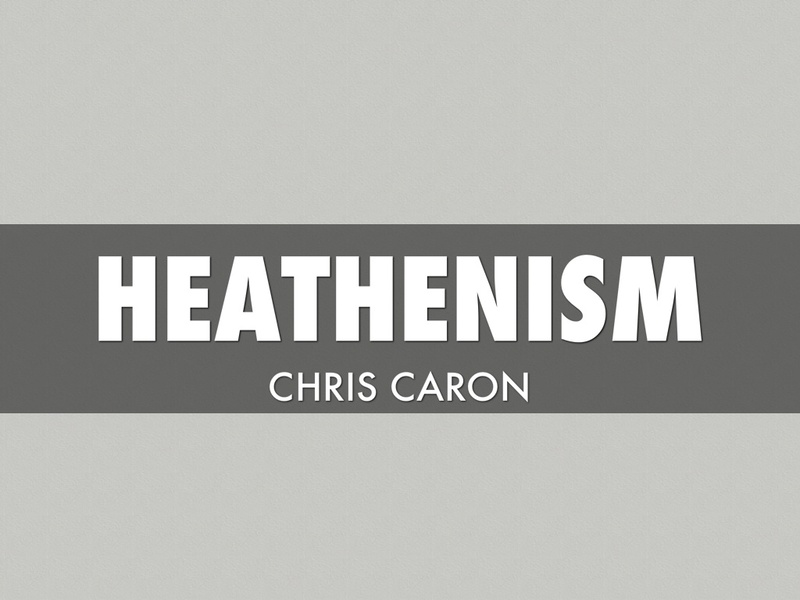 Heathens actively honor a subset of gods with whom they have developed personal relationships. Also honor their ancestors. Heathens also recognize a wide variety of spiritual beings. Interact with the house beings who live in their homes and the land beings who occupy features of the landscape such as streams, mountains and forests. Relationships with land beings is an important because Heathen rituals will not proceed until the permission of land beings is obtained. 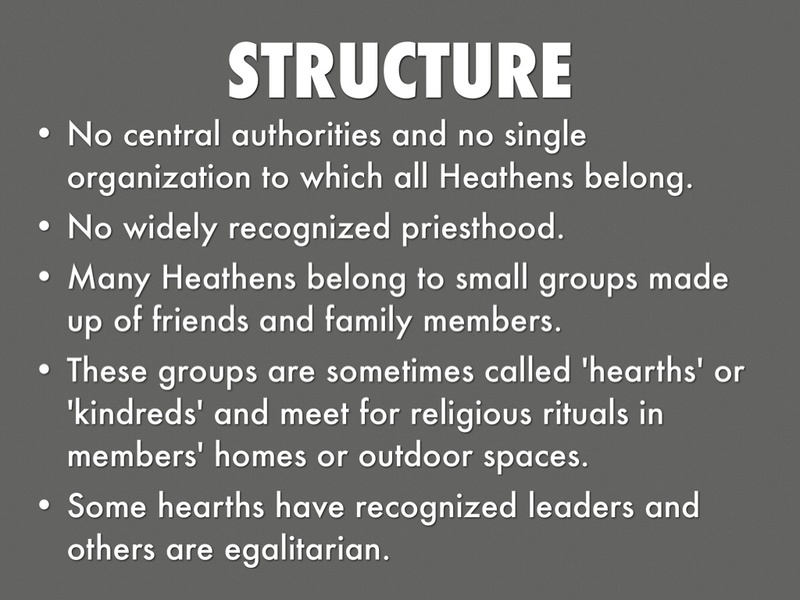 No central authorities and no single organization to which all Heathens belong. Many Heathens belong to small groups made up of friends and family members. These groups are sometimes called 'hearths' or 'kindreds' and meet for religious rituals in members' homes or outdoor spaces. Some hearths have recognized leaders and others are egalitarian. 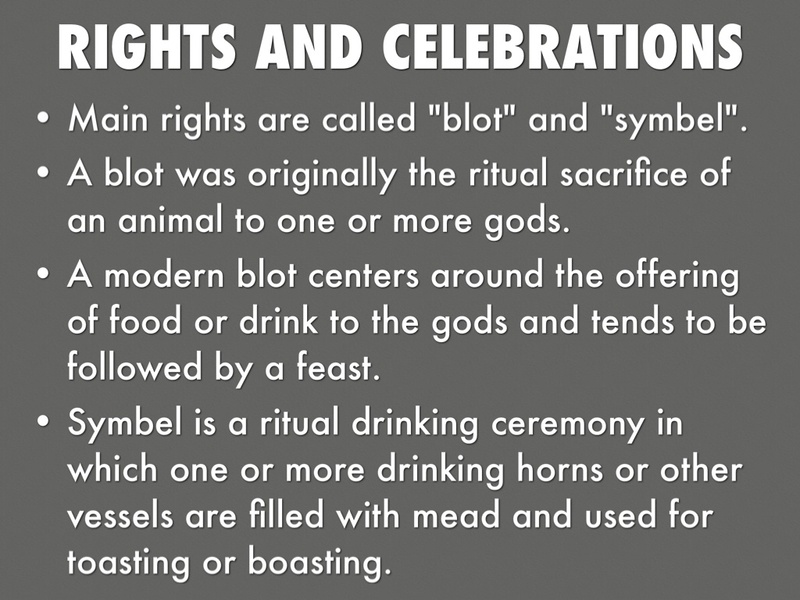 Main rights are called "blot" and "symbel". A blot was originally the ritual sacrifice of an animal to one or more gods. A modern blot centers around the offering of food or drink to the gods and tends to be followed by a feast. Symbel is a ritual drinking ceremony in which one or more drinking horns or other vessels are filled with mead and used for toasting or boasting. 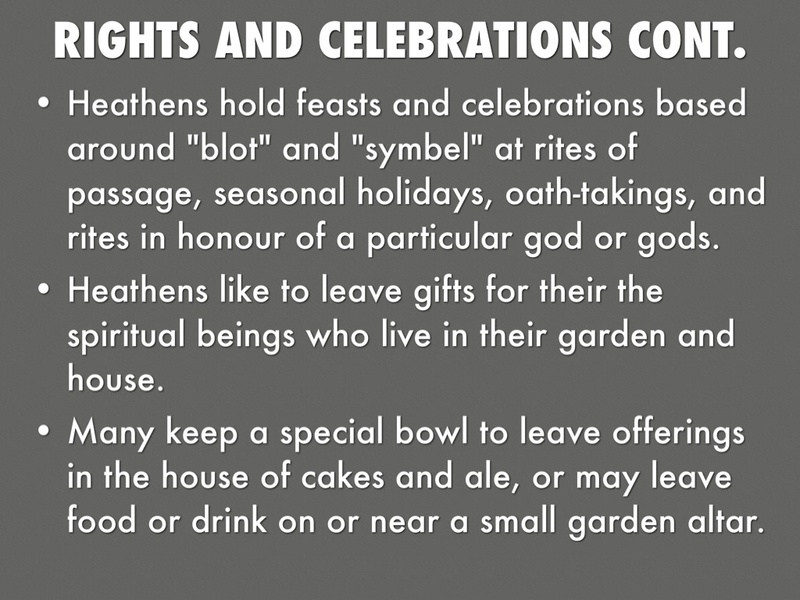 Heathens hold feasts and celebrations based around "blot" and "symbel" at rites of passage, seasonal holidays, oath-takings, and rites in honour of a particular god or gods. Heathens like to leave gifts for their the spiritual beings who live in their garden and house. Many keep a special bowl to leave offerings in the house of cakes and ale, or may leave food or drink on or near a small garden altar. Word is the force that connects everything in the universe throughout space and time. 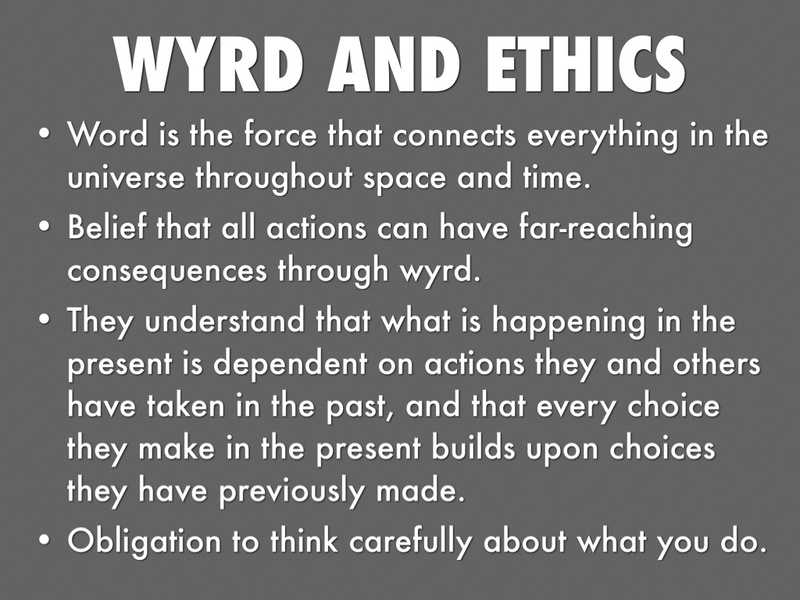 Belief that all actions can have far-reaching consequences through wyrd. They understand that what is happening in the present is dependent on actions they and others have taken in the past, and that every choice they make in the present builds upon choices they have previously made. Obligation to think carefully about what you do. 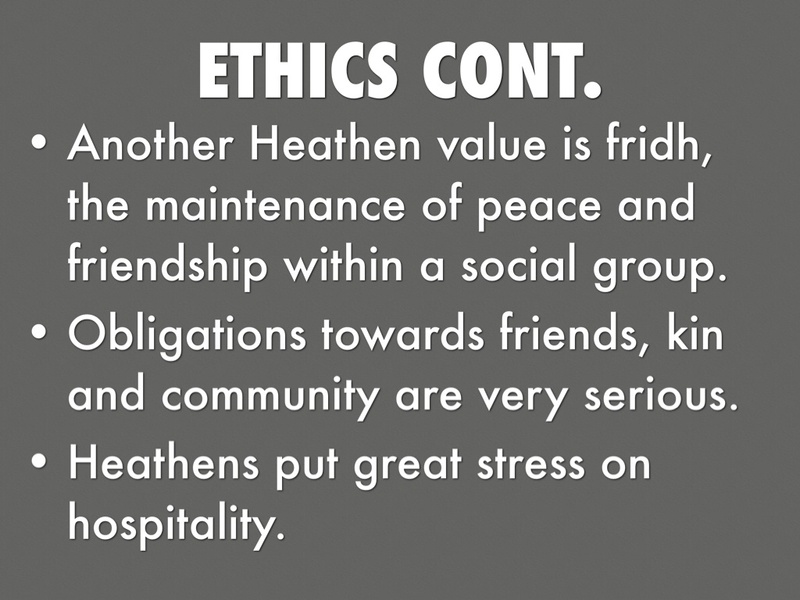 Another Heathen value is fridh, the maintenance of peace and friendship within a social group. 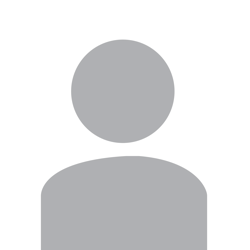 Obligations towards friends, kin and community are very serious. Heathens put great stress on hospitality. Honesty and forthrightness are also important. 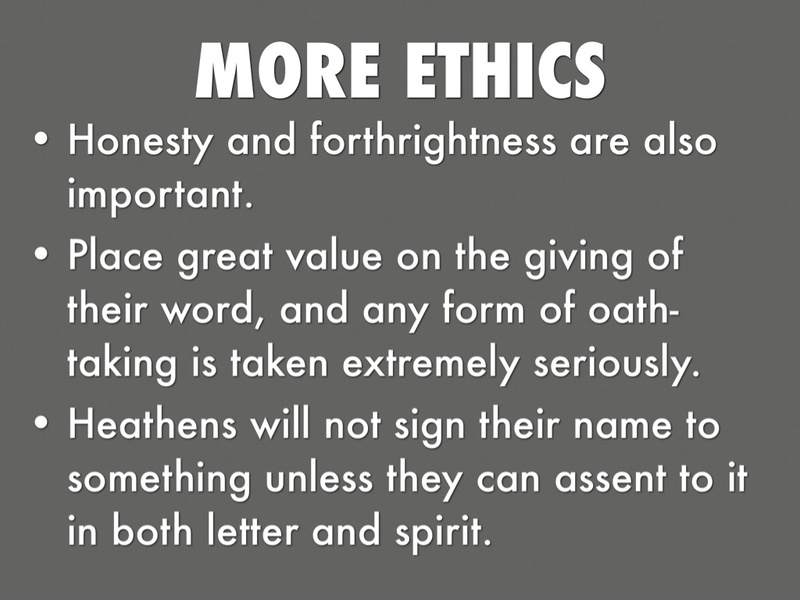 Place great value on the giving of their word, and any form of oath-taking is taken extremely seriously. Heathens will not sign their name to something unless they can assent to it in both letter and spirit. Focused on living in the present and does not place a great emphasis on the afterlife. Valhalla, or the god Odin's hall, is for warriors who die in battle. Those who drown at sea go to the goddess Ran's hall. 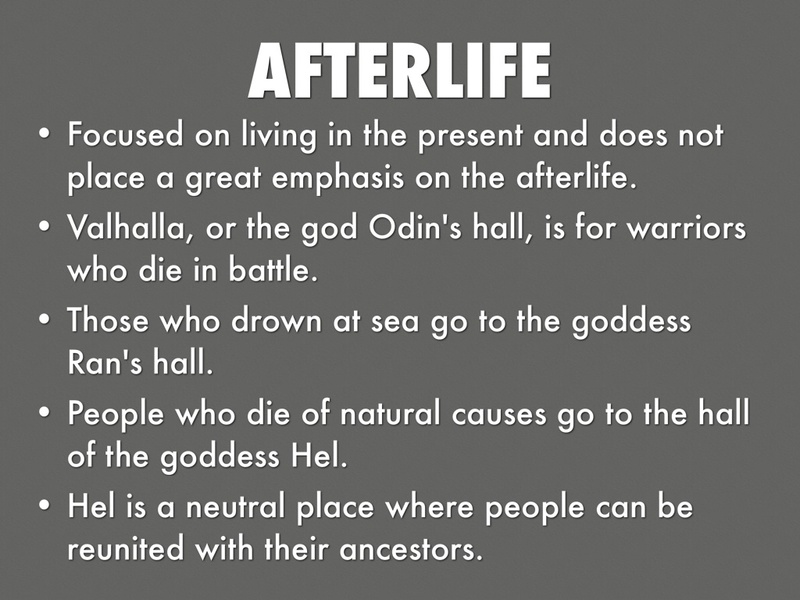 People who die of natural causes go to the hall of the goddess Hel. Hel is a neutral place where people can be reunited with their ancestors.